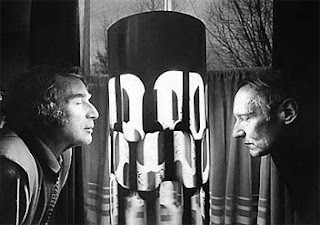 Of an older generation, Brion Gysin was a precursor to the Beats and a catalyst for them and for the bohemian generation that followed. His activities and interactions are the stuff of legend: he introduced Burroughs to the Dadaist “cut-up” method of writing; he worked as a multimedia artist, creating the “Dreamachine”, a stroboscopic device alleged to alter consciousness; he was proprietor of the “1001Nights” bistro in Tangier; he was artist in residence at the Beat Hotel in Paris; he submitted a recipe for hashish brownies to the Alice B. Toklas cookbook; he did avant-garde sound recordings and introduced the master musicians of Joujouka (his former house band) to Brian Jones. But for all his accomplishments, Gysin ended his life in 1986 (succumbing to cancer) with a wistful regret for having not pursued specific disciplines more diligently. He was a catalyst for so many, but in his own career he was all over the place. His was a peripatetic existence, following whatever artistic whim took his fancy at any particular time (he might now be classified by heartless psychiatry as ADHD). There is perhaps a lack of rigor in his work, more than made up for by enthusiasm, and in the end he was more muse than artist (Burroughs describes him in the Introduction as “the only man I ever respected” and “regal without a trace of pretension”). Still his art is worth seeing, and as such he is currently the subject of a major retrospective at New York’s New Museum of Contemporary Arts. It goes without saying that he died poor. The Last Museum is Gysin’s final novel, a loose and freewheeling remembrance of the famous Beat Hotel, told as postmortem adventure in the Bardo, the intermediate death state of Tibetan Buddhism. The work itself is, sadly, a truncated version of Gysin’s much longer unpublished text. There is a progression through the rooms of the Hotel, which is itself being removed piecemeal by the Interdead International Movers to a vast museum site on the San Andreas faultline (the west is the realm of the dead), where it will share space with the Sphinx, the Louvre, the Acropolis, and other detritus of human civilization. Anyone hoping for a simple and straightforward narrative will be disappointed; there are a dizzying number of shifts of name, gender, and sexual orientation, quite often within the same sentence. One of the pleasures of this book is in the anecdotes, the thinly disguised references to the Beats and their associates that we tease from the text. Gysin’s reimagining of his life as he travels the stygian stream of memory is scatological, raunchy, at times tedious, and at times hilarious. Apparently a life of Rabelaisian pansexuality was, in his last years, Gysin’s fondest recollection. He reveals himself - and I say this with no malice - as the pervert’s Dante. And yet the revelry - or the summary memory of it, the blessed and profane recollection- hurtles toward an end. After 28 days in the Bardo, the soul becomes rank. It was not meant to be stationary, and our hero, our Little PG, our Gysin surrogate with all memory spent yearns for that state to which all good Buddhists aspire: release. Despite the comfort, or horror, of a vision of the interconnected totality of existence, the obligatory peek at that Great White Light, and a cameo appearance by the Devourer of Souls, he longs for that laminated Get Out of Jail card, he seeks to beat cheeks from this mortal coil and not look back. “There is no one in this world I want to see again.” Before this freedom, the freedom which comes from nonexistence, all others pale. But is the sensuality a sacrament or an impediment? Does the road of excess lead, to paraphrase Blake, to enlightenment? Can the story have a happy ending? 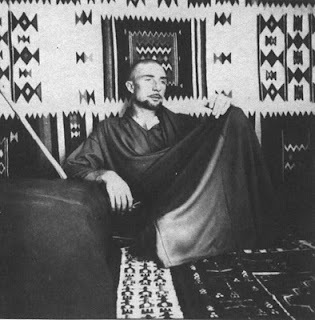 Brion Gysin died at the age of 70. Perhaps in the fullness of time he (or some constituent elements of him) will return to this plane of existence in yet another fleshy iteration and read his own text, and remember. Note: Nothing Is True - Everything is Permitted is a biography of Brion Gysin written by John Geiger. I have not read it, but it seems to have elicited favorable reviews. Great post. 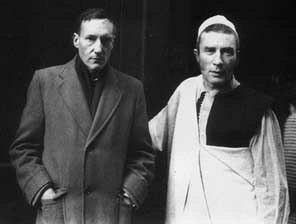 I am a very big Gysin fan. His work, rather, his concepts I apply to this day in my projects. Thanks for the links re the Dreamachine. I need to note that I don't endorse any products offered for sale through comment links.